Welcome back to The Project Stash! Before I share with you the amazing features from last week’s party, I’d like to let you know that Friday, November 15, I am kicking off this year’s “Homemade Holiday Party”. If you’d like to see what we did last year, go HERE. The past few days I have been sharing the “set up” parts to some of the homemade gifts I’ll be giving this year: Kahlua, Limoncello, and Vanilla Extract. Stop by and check it out! Anyway back to tonight’s party! Before we link up, let’s check out these great features from last week’s party! If you were featured, grab a button and strut your stuff! 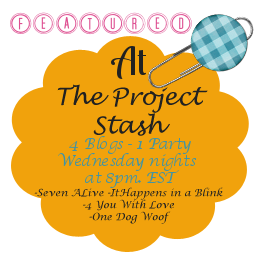 Now if you’re new around here, let me introduce you to The Project Stash co-hosts! If you’d like, take a moment to add our button to your blog somewhere (it’s on my side bar) – the more the merrier! Or, follow our hosts so you don’t miss out on all the great features each week! Okay, let’s link up!